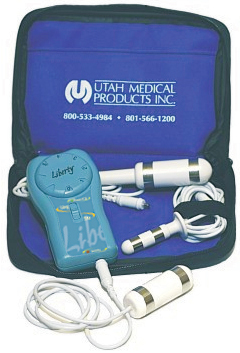 How to order your Liberty® Pelvic Floor Stimulation Therapy System for the Treatment of Urinary Incontinence. Getting your Liberty® Pelvic Floor Stimulation Therapy System is as simple as 1, 2, 3. Just follow the easy ordering instructions. The Liberty® PFS System is available by prescription only. Download and print the Liberty® Information Packet (contents: clinical brochures, order form and letter of medical necessity to take with you when you talk to your doctor about Liberty®. Use these materials to talk to your primary care doctor, gynecologist or urologist about how the Liberty® PFS System can help treat your urinary incontinence condition, and request that your doctor prescribe Liberty® for you. You or your doctor can contact a Liberty® Support Specialist toll free at 1.800.533.4984 x 4109 (M-F, 8:30am - 5:30pm Mountain Time) with any additional questions. All orders require payment before the Liberty® System can be shipped. 1. Complete the "Patient Information" section. All information is necessary to properly process the order. 2. Read and sign the "Purchase Agreement" section. 3. Your doctor should complete the "Prescription Information" section. 2. Copies (both sides) of your current insurance cards. 3. Any additional documents as listed on the Letter of Medical Necessity. Some private insurance companies cover a portion of the cost of the Liberty® PFS System. Contact a Liberty® Support Specialist or your insurer if you have any questions about your insurance coverage or filing a claim. How does Utah Medical Products, Inc. handle your information? Read our Health Information Privacy Notice. For help in any part of the ordering process, contact a Liberty® Support Specialist. format files can be viewed using Adobe Acrobat Reader.